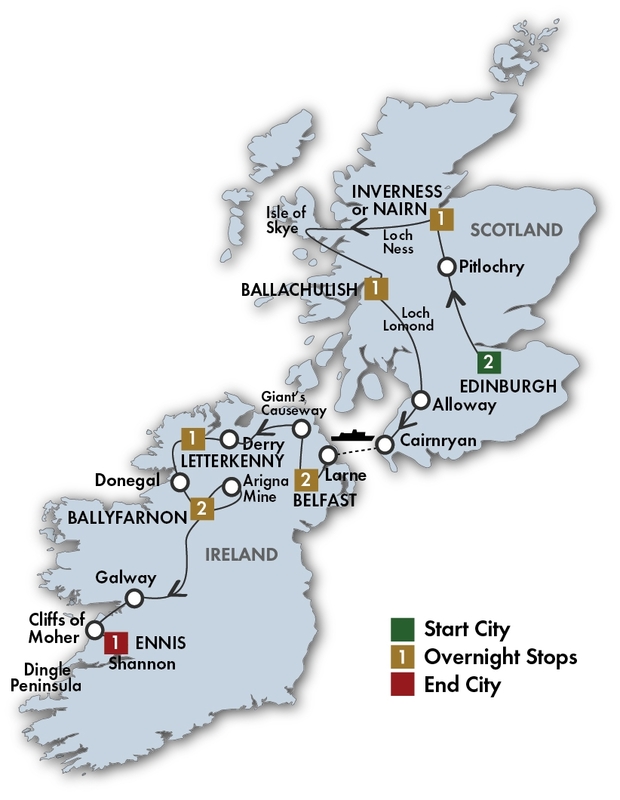 CIE The Scots Irish Tour Tour - CIE Tours International tours. Lowest Prices! Reserved seats for the Royal Edinburgh Military Tattoo on August 4 – 20 departures. Step aboard the Royal Yacht Britannia and see behind the scenes of the Queen’s former floating home. Sip an Irish coffee at the South Pole Inn where you’ll learn about Tom Crean, an Irish explorer who bravely journeyed to the South Pole. Arigna Mining Experience Arigna Mining Experience center was developed to preserve the energy heritage of the Arigna Valley and to ensure that Arigna maintains its link with Energy themes: Past, Present & Future. This Energy Centre provides visitors with a unique insight into what coal mining life was like in the Arigna Valley, since its beginning in the 1700's until closure in 1990. Cliffs of Moher One of Ireland’s top visitor attractions, the cliffs are 700 feet high and extendfor 5 miles over the Atlantic Ocean on the western seaboard of County Clare. O’Brien’sTower stands proudly on a headland and one can see the Aran Islands, Galway Bay and Connemara.The cliffs are home to major colonies of cliff nesting seabirds. Giant's Causeway The Giant's Causeway, renowned for its hexagonal basalt columns, was created from a volcaniceruption 60 million years ago. It is Northern Ireland's only UNESCO World Heritage Site and one ofIreland's most popular visitor attractions. It is steeped in myth and legend, especially about themighty giant, Finn McCool. Glenveagh Castle & National Park Glenveagh Castle is a 19th century castellated mansion and was built between 1867 and 1873. Its construction in a remote mountain setting was inspired by the Victorian idyll of a romantic highland retreat. Robert Burns Birthplace Museum Royal Yacht Britannia Home to Her Majesty The Queen and the Royal Family for over 40 years, this intimate yacht sailed around the world.Now berthed in Edinburgh, you can discover this most special of royal residences. Titanic Belfast Opened in April 2012 to commemorate the centenary of the sinking of this iconicship, this new visitor experience tells the story of the Titanic from conceptionand construction right through the maiden voyage and tragic ending. 10 (B) and 9 (D) including a Scottish evening in Edinburgh, and a festive Medieval castle banquet. Tour begins 2:00 PM at your Edinburgh hotel. Tour the Royal Yacht Britannia, the former floating home of the Queen on many of her travels. Enjoy a welcome drink with your group before dinner.